The brilliant Dr. Robert Weiss did something completely unheard of in the medical community. This doctor sells his practice and decides to teach the importance of diet and nutrition in health by opening a “Farmacy”. Dr. Weiss believes that we all need to change our focus for medicine and health and reconnect with the basic knowledge that has been shunned and suppressed by big pharma. 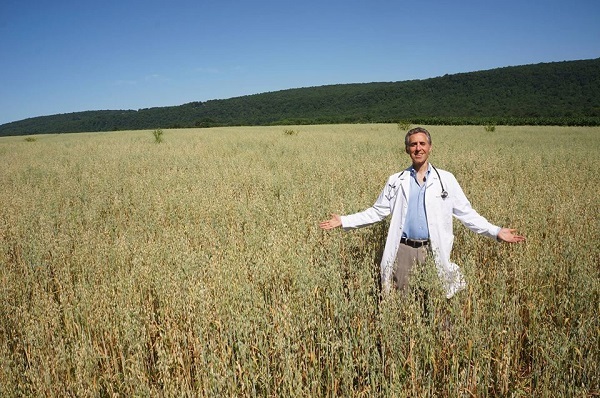 After selling his New York medical practice, Dr. Robert Weiss built the very first farm-based medical practice on his 348-acre farm. Located in Long Valley, New Jersey the ‘farmacy’ is focused on treating patients with plant foods as the medicine. “Plant-based whole foods are the most powerful disease-modifying tools available to practitioners — more powerful than any drugs or surgeries,” said Dr. Weiss. Billions of people have been drugged with synthetic chemicals. In order to treat diseases big pharma has pushed the sale and consumption of synthetic chemicals. All while the research and awareness for the benefits of plants and herbs have taken a major back seat in society. Even though plants have been used quite successfully since ancient times many people go straight to pharmaceutical drugs whenever they are sick. The priority for the new Farmacy approach is to bring the body back into balance through eating vegetables, grains, fruit, nuts, seeds and beans. The natural parts of plants contain nutrients that allow your body to heal. For example many foods such as turmeric act as an anti-inflammatory. Inflammation or swelling is believed to be the cause of many different chronic diseases. Even something simple like this salad contains many important medicinal ingredients. Society needs to get its drug dependence under control. The main goal is to reduce societies over-dependence on dangerous pharmaceuticals. This will help remove the negative side effects including addiction, overdose, and even death. Another one of his goals is to avoid unnecessary surgeries through bringing balance back to the body. In the case of 90-year-old Angelina Rotella from West New York, Dr. Weiss mentions her incredible success story. The night before Christmas Eve Angelina Rotella came into his office with congestive heart failure and in a wheelchair. Her prescription was a strict diet which included “grains (such as whole-grain brown rice and sweet potatoes), steamed greens (including kale and spinach), fruit (a big serving of wild organic blueberries is a must) and water.” Her daughter, Angie Rotella-Suarez, calls it “more than a miracle,” because her mother was able to stop taking her blood pressure heart medications 2 weeks later. News of the great success spread and daughters Rotella-Suarez and her sister decided to try the same diet where they became no longer pre-diabetic and lost around 40 pounds. 90 families have joined the farmacy. 90 families have joined the local farmacy and in addition to paying a membership fee they volunteer their time harvesting vegetables and picking weeds. Not only is this great exercise but it helps people get more interested in eating healthy by becoming involved in the food production process. In addition to spreading awareness about health and nutrition, a recent study showed that when you work in the earth such as with gardening you make contact with bacteria in the soil that will release serotonin in your brain that helps you become smarter and feel happier. Do you feel that we should do this all over the world? Let us know your thoughts in the comments below.